When can kids start strength training, and how should they do it? Is strength training for kids a good idea? Yes! Building muscle strength offers many benefits (to both kids and adults). Body weight and resistance exercise can improve bone mineral density (in other words, make bones stronger). It can build your child's self-esteem (who doesn't like feeling strong?). It can improve her balance and even her cholesterol levels. "Strength training, when done correctly, can improve the overall health of children and adolescents of all athletic abilities," says Katherine Stabenow Dahab, MD, who did a comprehensive review of scientific research on the topic (published in the journal Sports Health). Strength training can improve your athlete's performance in the sport of her choice. It can also boost metabolism, and help your child reach a healthy weight and maintain it. There are risks associated with strength training, such as growth-plate fractures and lower back injuries. However, "the health benefits of strength training far outweigh the potential risks," Dr. Dahab says. 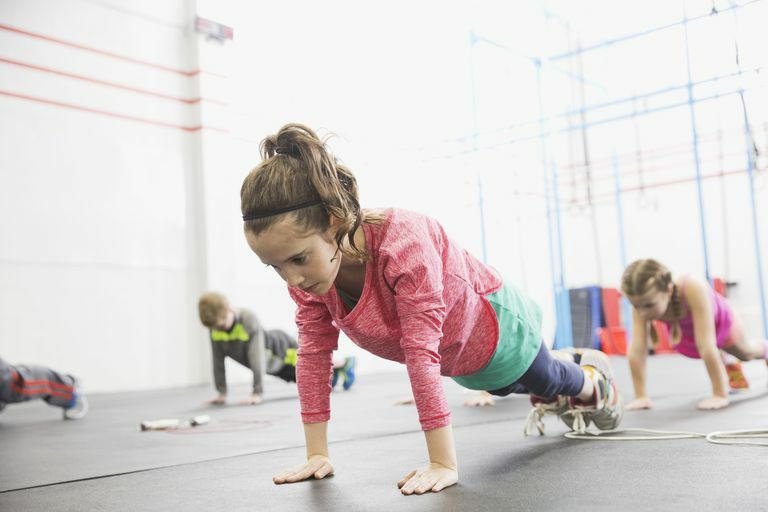 When Should Strength Training for Kids Start? Even preschoolers (ages 3 to 5) can strength train, although this does not mean they should be lifting weights. Instead, they can do simple exercises that use body weight as resistance—and are fun too. Try cobra push-ups, for example: Kids start face-down on the floor, with hands underneath the shoulders and elbows bent. Then they push up, lifting their heads and chests up and forward (but keeping hands, forearms, bellies, and legs on the floor). Between ages 6 and 9, kids can begin to use equipment to add resistance beyond their own body weight. Try resistance bands or tubes, or light medicine balls or hand weights. (You can also make your own hand weights with household items.) The American Academy of Pediatrics created a strength training for beginners app for iPod, iPhone, and iPad. It's called IronKids and it includes demos of exercises for the core, upper body, and lower body. You can also use the app to create custom workouts and set goals and reminders. After puberty, muscles can begin to bulk up as a result of strength training. At this age, kids need to be educated about the dangers of anabolic steroids. Steroids are illegal and dangerous, and other muscle-building supplements—even herbal ones touted as "safe"—may be too. At all ages, emphasize slow, controlled movements and proper form. The idea is to make muscles stronger, not necessarily bigger (like bodybuilders do). Before encouraging your child to strength train, make sure he is mature enough to follow directions and perform movements safely. Dahab MD, Katherine Stabenow, and McCambridge MD, Teri Metcalf. Strength Training in Children and Adolescents: Raising the Bar for Young Athletes? Sports Health: A Multidisciplinary Approach, May/June 2009 vol. 1 no. 3.